We are cricket farmers specializing in raising miniature livestock for human consumption. Our livestock is organic and top of the line. Iowa Cricket Farmer LLC is unique in that it is one of only a few businesses in the country that specializes in raising organic crickets for human consumption, and the only one in the state of Iowa. Eventually, we would prefer to sell our crickets to local entities such as restaurants and food retailers, but starting out we will be targeting national companies that presently produce cricket protein bars and other foods using crickets as the protein. As it is, the demand for human-edible crickets is higher than the supply so we are looking to fill part of the void. Eventually we may expand to include other edible insects, but we are starting with crickets because they are considered the "gateway bug" when it comes to entomophagy. A byproduct of cricket husbandry is the fertilizer that we can collect and sell to local gardeners (and use in our organic vegetable garden we will be growing to supplement our cricket feed.) Insects can provide sustainable protein for humans without creating such a heavy carbon footprint as traditional agricultural livestock. In fact, in 2013 the Food and Agriculture Organization (FAO) of the United Nations published a report entitled, "Edible Insects: Future Prospects for Food and Feed Security." Crickets are already accepted as a good source of protein in the health market community, and we are hoping to bring them into the mainstream community here in Iowa. We also hope to help bring revitalization to our Main Street community in Keystone, Iowa. Keystone is an agricultural community with a rich history that dates back to the mid to late 1800s. Our business is right on Main Street, and we are hoping to build partnerships with local FFAs to teach about the health and environmental advantages of raising crickets. We used our start-up capital to buy a 3,800 sq ft building that used to be a restaurant in Keystone, IA. We will be stacking our cricket "tubs" three high throughout and are hoping to produce at least 1,500 lbs of crickets every six weeks once we are operating at 100%. We predict that most of the cost of raising the crickets will mainly coming from feeding the crickets and keeping the building warm enough for the crickets to breed. Because of this, we would like to purchase a few breeding "tents" that are climate and humidity controlled that we could place inside of our building for the egg-laying stage of growth. Crickets prefer to breed in balmy temperatures (85-90 degrees F) and to trap and effectively heat the breeding chambers it would be beneficial to have large tents for this purpose. These tents are quite expensive so we would use the money to go toward purchasing them. I raise Pacific White shrimp in a super intensive system. My shrimp are raised without any hormones or antibiotics. They are sold out the door to local consumers and businesses. Do you know anyone raising shrimp in the Midwest? There are only a handful of people that are producing shrimp inland. What is so unique about my shrimp farming is that they are raised in the same water forever. I have a zero discharge of waste into the environment with my water, and I have bacteria that is put into the water converting the ammonia (waste from shrimp) back into feed for the shrimp. That combined with the fact that I am raising shrimp in tanks, in subzero temperatures, in Iowa, make this truly unique. Not just to Iowa, but to our country as whole. We need to continue to find sustainable ways to increase agriculture production in any environment. I am applying for this grant to help expand my shrimp operation. 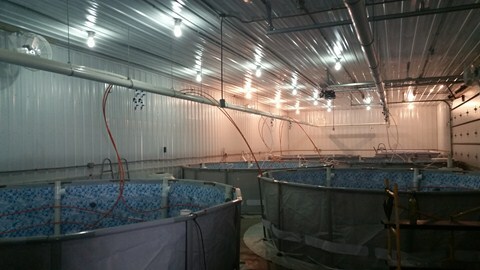 Right now, I only have a 5 tank system, the money would help me to expand into a larger building, helping me to produce more shrimp. I would also like to have the smallest waste footprint I can attain, and with the help of the grant funds, I would be able to install solar panels. Solar panels would make my farm virtually self sustaining. Electricity is my biggest expense, and not having that expense AND helping our environment is a win-win situation. Tillage is a web-based farmland realty application that increases access and usability of farmland data. It does this for farmers and farmland brokers by providing alerts about farmland for sale and rent, a land management dashboard and marketing creation tools. The problem is that finding farmland to cultivate is a tedious, time-consuming process with little insightful information available. Tillage streamlines this process from the broker to the landowner, decreasing search time, simplifying marketing efforts and increasing access to valuable data. Our competition is farmland listing sites and online realty data tools. Tillage’s competitive advantage is that we provide an intuitive user-friendly experience while providing access to comprehensive and customizable data, unlike our competitors. We are located in Ames, Iowa, home of Iowa State University, where we have access to world-renowned agricultural researchers and scientists, who we are collaborating with to develop the best product possible. We are also unique in the way our product is priced, providing free farmland listings and posting them ourselves, unlike our competitors. We make money through a freemium model, offering free and tier-based monthly and annual subscriptions for access to various features. The total available market for Tillage is 3.15 million people and $276 million, based on calculations from USDA data of industry numbers and how much money farmland brokers currently earn. The serviceable available market for Tillage is 750,000 people and $69 million, based on the percentage of the total available market share we can achieve. The target market for Tillage is 200,000 farmers and brokers in Iowa, which equates to $6.5 million. There are several trends that are advantageous for Tillage. According to the American Farm Bureau Federation, 60% of U.S. farmers and ranchers use precision agriculture technologies. According to the USDA, 70% of farms in the U.S. have internet access. According to the Iowa State University Extension and Outreach Land Values Survey, Iowa farmland values have quadrupled in 10 years. Because of these trends, more farmers and realtors will be utilizing online tools to search for and analyze data about farmland for sale. Tillage provides a solution that does just that. We’ve conducted dozens of customer discovery interviews to confirm our assumptions and have spent time developing the product while simultaneously gathering customer feedback. The Tillage solution is a viable business that is made possible because it solves a real problem in the marketplace today. We are applying for Dream Big, Grow Here - because farmers deserve access to reliable farmland information when making the largest purchasing decision of their operation. I grew up on a 5th generation family dairy farm and was actively involved in 4-H and FFA; agriculture runs in my veins. I have seen, first-hand, the doubt and frustration that occurs when there is a lack of information. I have a passion for people and believe this solution will help everyday people, like my grandparents who work hard day-in and day-out on the farm. It will help the local farmland broker who lives down the street. It will help people who live in rural places throughout Iowa and America. I’ve assembled a diverse team with a unique skillset that positions us perfectly to develop our first product. The money from this contest will be used for customer discovery expenses, web-hosting services and trade-show marketing materials - all of which will be enough for us to launch our minimum viable product for farmers. SwineTech, is an Iowa-based company located in New Sharon, striving to be a leading producer of farrowing monitoring systems for sow farms in the pork industry. Our mission is to leave no piglet behind. Last year over 13 million piglets were crushed in the U.S. alone, and this cost the pork industry over $689 million dollars. SwineTech's product will be sold all throughout the world and will maintain a reputation for having superior quality. While SwineTech’s sales have yet to get under way, the demand for their product “Echo” continues to grow in this $21 billion market. Last year over 80 million piglets died because they were laid on and crushed by their mom. This is costing the average corporate hog farm over $276,000 a year. Last year about sixty percent of the piglets died from being laid-on by sows, which is over fifty percent higher than the next leading cause of piglet death loss, the next being disease. During Farrowing, sows lay down to rest after eating, and crush their piglets. During the first couple of litters, sows are more aggressive when a piglet squeals, and are more prone to stand. However, older sows are larger and their joints are no longer what they used to be and this leads to more crushed piglets. A sow will typically have ten to fourteen piglets a litter and is capable of having 3 litters a year, with up to 14 litters in a lifetime. On average, one to three piglets per litter will die from being laid on. Echo is a device that’s strategically placed on the side of the farrowing crate, that is special in the fact that it focusses on all aspects of the problem. It hits each aspect by following 3 distinct phases/features. First, the “Preventive Feature” will analyze the temperature of each crate and adjust it to optimize the piglets’ health. This is a preventive approach because the optimized climate encourages the piglets to wander from underneath their mom when they are not eating. Second, the “Proactive Feature” will be able to analyze the piglet’s squeal and detect is one is being laid-on. SwineTech’s design works by continuously sampling the audio input stream, and identifying lay-on events by the unique combination of audio frequency, volume and duration. After a programmed delay to allow the sow to stand up on her own, Echo will alert the sow with an initially gentle impulse, graduating to a higher strength signal after another delay until she stands up, saving another piglet’s life. Echo will deliver a gentle impulse to the sow alerting her to stand up, giving the piglet enough time to escape out from below. When the sow lays down to rest, piglets tend to be underneath seeking warmth or food and, in some cases, the sow will lay on her piglets, suffocating them. When piglets are being laid on, they deliver a very loud squeal that tends to last approximately thirty to sixty seconds. Echo will pick up those frequencies and communicate to a device on the sow’s flanks. This is the device that will deliver the impulse to the sow. The device is similar to an A.I. Buddy, which is a belt-like structure that will be located around the flank of the sow. Third, the “Reactive Feature” will alert a farmer, via an App or Email, when an abnormal activity is occurring within a farrowing crate. The collar, acting as a Fitbit, will take the sow’s vitals and allow farmers to better understand what is going on in each pen. The benefits of using Echo include: less laid-on piglets, healthier piglets, fewer pressure sores, cost savings on medications, and thousands of dollars in additional revenue. Some of the long term benefits are: sows will be healthier and as a result live longer, produce higher quality and quantity of milk for piglets, and the sow can increase the number of piglets in her next farrowing cycle. Our profit margins for "Echo" are 76% at a price of $1,000 per unit. SwineTech’s sales will occur through a direct sales force, because it is the most effective in establishing a solid customer base and in building a good reputation. Our target is to hit 14% of industry projecting $56 million in revenue in five years. The pork industry is growing faster than any other form of livestock and shows a continued growth trajectory over the next five to ten years. SwineTech is in a position to capitalize on this by helping farmers increase their production and revenue at an average of $109,000 per year at a low input cost, outperforming their competitors, and an aggressive marketing and sales campaign to ramp up the company’s growth projections for the foreseeable future. The money will be used to pay for supplies and manufacturing of our field trials devices. This will validate our product's efficiency and will give us reliable data to show our costumers. We will be running fields trials and this would help with creating ten more products to test. This would allow us to expand, which would help create jobs within our community. We are still a risky venture so capital is hard to come by. We are trying to run field trials in order to validate the idea to increase our evaluation, so that we can more effectively raise funds. Our mission is to redefine the way we farm. Smart Ag's products will enable farm operators big and small to benefit from affordable and cutting edge technology. Smaller, cheaper and smarter equipment can transform how food is grown by making farming easier and more sustainable. Smart Ag offers a complete solution for autonomous farming based on the AAVI (Autonomous Ag Vehicle Intelligence) software platform and the SAVAG (Small Autonomous Vehicles for Ag) line of equipment. The farm equipment is sold online and though traditional channels like dealers. To run the farm equipment it is necessary for it to be connected to AAVI. AAVI is monetized through an annual subscription model per connected machine. Today there are many precision agriculture companies and technologies however there is not any way for farms to use completely automated equipment or benefit from the major advantages of internet connected equipment. One unique advantage of Smart Ag is that it offers a break-even conversion cost from conventional equipment and provides open API's to the AAVI platform encouraging extremely rapid and low cost innovation from willing 3rd parties. Smart Ag also allows farms to scale the size of their fleet one small machine at a time without additional programming or supporting infrastructure. Furthermore Smart Ag’s AAVI platform can run and control other brands of agriculture vehicles making it the go to resource for autonomous and internet connected farming. The market for Smart Ag is the row crop market of corn and soybeans (88.9 million acres of corn and 85.1 million acres of soybeans in 2015). This market is segmented primarily by farm size. Farms over 1,000 acres are the primary users today's large and expensive equipment. Research indicates that there are more than 18,750 farms in our market segment, and that number is increasing by 1-3% each year (NASS, 2007). Based on those numbers Smart Ag has a total available market of $1.12 billion in the tillage sector. We realistically expect to capture a 2% market share in 5 years. The first step towards commercializing our technology is to develop a prototype for SAVAG and AAVI. We are contracting with EvaTech INC. to build the SAVAG prototype which will cost approximately $35,000. To develop AAVI we have contracted with several software developers and a team of computer engineering students at ISU. We expect the development of the AAVI prototype to take 1,000 man hours at $60/hr. Bringing the total development cost of the technology to $95,000. So far we have raised $50,000 dollars in the form of a convertible note which leaves us seeking an additional $45,000 which we hope we can raise through this competition other state of Iowa resources. AccuGrain provides real time grain weight measurements for farmers, commercial grain operators and grain processors. We offer solutions in areas previously constrained by technology and cost limitations. Designed by farmers for the agriculture industry, AccuGrain is redefining grain measurement. AccuGrain provides a solution to the problem of not being able to measure the weight of grain in real-time for farmers, ethanol plants, and grain cooperatives. While there are some technologies on the market today that offer such solutions, none are as cost effective and simple to implement as AccuGrain. By utilizing patented X-Ray technology from Iowa State University, our sensor has no moving parts, is simple to operate, and is adaptable across a wide variety of applications. The total market for AccuGrain products are the over 300,000 grain storage sites across the United States, nearly 1500 of which are located in Iowa. AccuGrain, LLC will make money through direct product sales to these locations, as well as through recurring software licenses. As a team, each of our diverse backgrounds mesh together to provide the skill set we need to design, build, and market our new product. We are applying because we are an Iowa company building a product designed for Iowa agriculture, which is exactly what the title of this award conveys. Our goal is to gain positive exposure for our company through this process and if we are fortunate enough to win, use the prize money to support the marketing of our first product. We have spent many long hours and resources developing our product and are now faced with the challenge of turning the concept into a successful business. Our business model has come a long way since our appearance in last years DBGH contest, in large part thanks to our 6 week Venture School (through the University of Iowa, hosted in Sioux City, IA.) We were awarded the pivot award and recognized by many for the most positive growth as a business from start to finish. We are unique because there is nothing like our product on the market. We have created a product that is being used to protect trees and provide more water to the root system of young trees, summed up, we are an all-in-one product for total tree care. We will grow revenue by tapping into the tree planting communities across the country and beyond.Our target market consists of city, county, state and government entities. These institutions are allocating millions of dollars each year to planting trees in their communities in an effort to restore the tree canopies. They have arborists on staff who understand the impact on the environment, energy conservation and health benefits to their communities. With so much money being spent on the purchase, planting, maintenance and at times, the re-planting of trees; we feel we are in the right place, at the right time, with the right product to tap into this industry and more importantly this community of environmentally conscious tree-people. Innovation is at the heart of TreePans and ultimately the feature that turns heads the most. Our expandable door system is the first of its kind in the tree care industry. 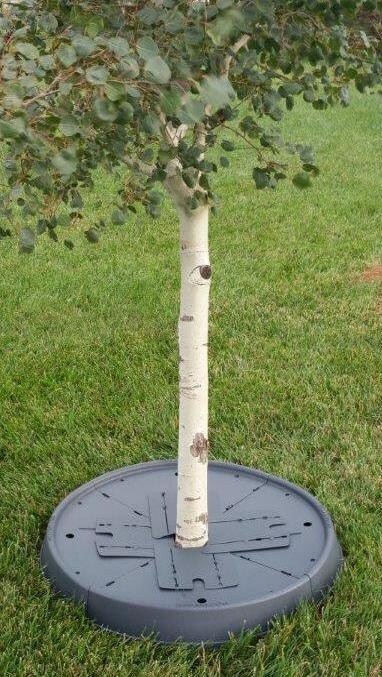 From 1 inch in diameter to 1 foot our TreePans can expand with the growth of your young trees. This (patent pending) door design is also eliminating weed competition and retaining moisture in the soil for on average 13 days longer than standard mulching. We are serving many individuals from home owners, to cities, to landscaping crews and orchard growers. We would like to say our market size is endless. With billions of dollars being put into canopy programs and grants helping cities to plant millions of trees, we hope to take a small percentage of these urban forestry programs this year. With help from mentors and business consultants, we have evaluated our market size at 147 million per year in the United States, based upon 4,250,000 trees being planted annually. Our reason for applying to Dream Big, Grow Here is to help fund our marketing and sales efforts in 2016. We are scheduled to attend many trade shows this season and are sure that these shows will lead to many networking opportunities, future traveling, and most importantly, sales. To be awarded this money would ensure that we would be able to provide funds to focus on community outreach and sales. In addition to promoting our products at the trade shows as mentioned above, we will be launching a large online presence and eCommerce push in 2016. These funds will provide us the financial needs to update our website, work with developers on eCommerce capability, target potential buyers through social media marketing and much more.